Recently the debate about the nature and effiacy of digital activism has become increasingly heated. Compare for example the dialogue between Patrick Meier and Evgeny Morozov. The first optimism of the early days has given way to a more balanced view on the motivation and effects of digital activism. 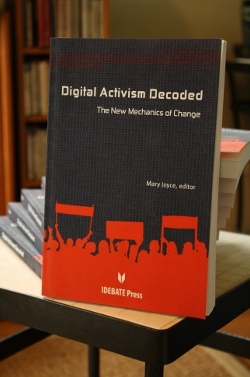 In this ongoing debate a new book “Digital Activism Decoded: The New Mechanics of Change” edited by Mary Joyce offers a collection of texts that deal with digital activism from different perspectives. Mary offers her rationale for the book in this interview. For this collection I cowrote a chapter with Dan Schultz with the title “Applications: Picking the Right One in a Transient World”. The chapter discusses practical questions, which activists have to face when choosing digital tools for their campaigns. The chapter is no scientific text, instead it tries to offer a practical guideline by which activists can make sense out of the many digital tools out there. You can download the entire book for free at the Meta-Activism Project or order a paperbased version at amazon be it .de or .com. The German publication Der Freitag has a review of the book. The blog Sealing the Generation Gap reviews Dan’s and my chapter: “All human wisdom is contained in two words: wait and hope.” Must say, any review that mentions “The Count of Monte Christo” and a text of mine in the same article puts a smile on my face. Steven J. Murdoch blogs on his chapter: “Destructive Activism: The Double-Edged Sword of Digital Tactics“. Dave Karpf blogs on his chapter: “Measuring the Success of Digital Campaigns“. Simon Columbus blogs on his chapter: “The New Casualties: Prisons and Persecution“. In addition to that there is a video of a discussion with Mary Joyce at the New America Foundation. On her blog Adler-Auge Alexandra Ripken gives a short wrap-up to my talk on the recent CDU social media campaigns in Hessen 2009, for the German general election 2009 and the campaign in Nordrhein-Westfalen 2010, which I gave at a recent alumi meeting of the Fundraising Akademie. It’s nice to hear that the talk went well.